The domino effect on a farm is real, far-reaching, and sometimes humorous. When we walk outside our farmhouse in the mornings and evenings, the effect takes hold. The dogs start jumping around vying for our attention before we start the feeding process. The cats run into the shed to get their daily food. The dogs then run into the shed with us and begin scavenging for hidden eggs laid by errant chickens who frequent the shed looking for leftover cat food. It happens every time. I have to find the eggs before my dogs find them lying in various locations on the ground. Yes, the chickens have a nice coop with nice nesting boxes. No, they are not supposed to be in the shed laying eggs. We try. Hard. Really hard. We rack our brains nightly about how to keep our animals in their own spaces with their own food with their own fellow breed of animals. However, there is ALWAYS at least one animal who wants to explore the boundaries, squeeze through fencing, jump over fencing, swim around fencing, and find a way into the other animal’s space. Even two of our docile cows have found a way to swim across the ravine and enter into the spaces reserved for our family, our dogs, and our cats. Due to their stubborn insistence on eating the grass in the pasture near the house, we have to deal with their cow paddies, their shenanigans which include chasing our cats and dogs and terrifying them all, and the fact they think they are family pets. Since they are about 1,000 pounds each, I have told The Outdoorsman to please stop treating them like dogs so they will realize they are cows. Yes, they are adorable and friendly, but they have almost knocked me over on occasion with their desire to be pet and rubbed like a dog. Try giving a little scratch on the head to a 1,000 pound animal who is pressing against you to gain more scratching leverage! 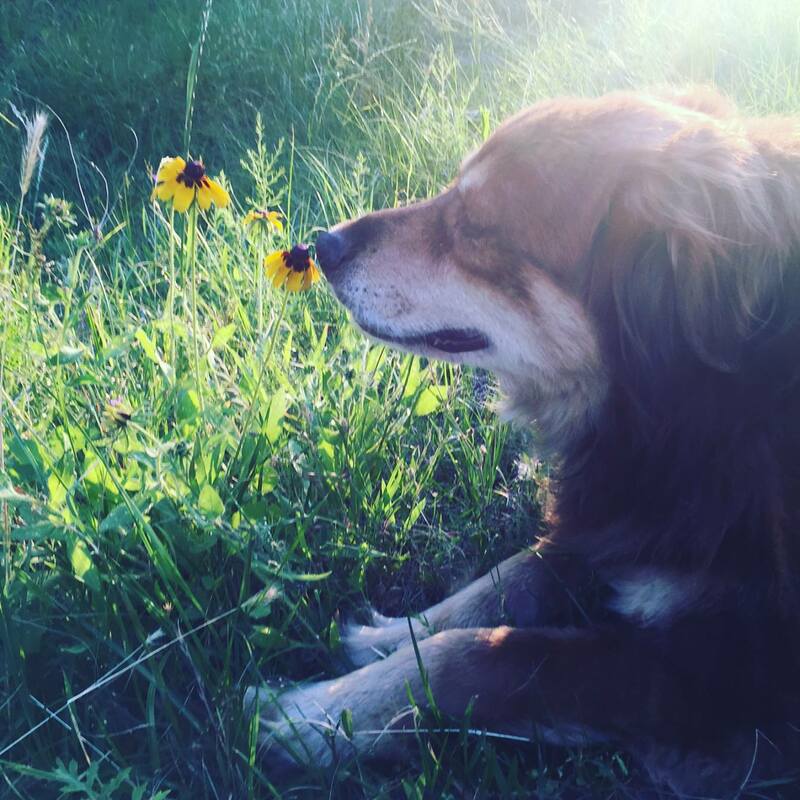 This morning, I was watching our beautiful Australian Shepherd dog, Daisy (pictured above smelling a flower…seriously, she did it twice before I took these pictures! ), going from water bowl to water trough looking for water. The pet cows had drunk every single ounce of water in the front pasture. The reason Daisy wasn’t going to the pond for a drink is because the donkeys guard the back pasture and she has, unfortunately, had a bad run-in with our donkeys and, since she is as smart as a whip, she will not step foot in that pasture unless we are personally escorting her the entire way. Since I knew she was thirsty, I went outside in my pajamas and started filling up all of the water troughs and buckets so that our dogs and cats could drink. On my way to get the water hose, I came upon an open door to the feed room. That is never a good thing. Lo and behold, there were our three sheep, Leonardo, Mona Lisa, and Picasso, eating their fill of the sweet feed that was sitting on the ground. Thankfully, there was not much left in the bag and not much else in the feed room that was open or available to them so I think they will be okay. It is ALMOST humorous at times how quickly animals find things that are open or unprotected. We have lost many a pair of gloves to our animals when we are working outside and, inadvertently, leave a pair of gloves sitting on the golf cart. The Outdoorsman is a pro at setting things down in random places only to have them reappear in tiny pieces in the front of our house in the dog’s play area. We had to banish the donkeys to the back pastures after they started opening lids of feed containers anytime they found an opportunity available in the barn. I have been amazed at the cleverness of the donkeys. They watch everything you do and, at times, mimic it to a tee. One time we were gathering up sticks and pieces of wood for a fire and our donkey, Fiona, started picking up sticks and carrying them in her mouth. They are truly entertaining and adorable creatures who love to interact with humans. The only big downfall with our donkeys is that dogs are their natural enemies so we have to watch them like a hawk when our dogs are with us in the back pastures. One of the things that is always changing and growing is our need for fencing and housing for the animals on Green Acres. Talking about a domino effect. We are constantly feeling the effect of gaining new animals on the farm. The reason we are constantly working on fencing and housing is that our animals are increasing in number rapidly due to new births and new purchases we have made. We are trying to avoid purchasing new breeds of animals….okay, we may have squeezed in a couple of new ducks with our poultry order about a month ago, but other than that, we are only purchasing the breeds we already enjoy on Green Acres. As we narrow our focus on the desired breeds, we are building fencing and housing that will accommodate those animals the best. Probably our biggest area of weakness is purchasing animals before we have the adequate housing completely finished. This has happened several times when we have stumbled upon spectacular deals on registered Longhorns and desired breeds of chickens and piglets. It causes us to constantly feel like we are chasing a train from behind as it steams forward on the tracks. It is kinda crazy for me to admit, but I have grown accustomed to the feeling of chasing the train on this crazy journey we began when we moved to Green Acres a little over two years ago. I feel certain that one day soon, we will catch the train and be able to ride in the passenger car as we gaze out the window at what we have created with our own hands. What a wonderful feeling that will be! The good news is that we are definitely making progress one project at a time! As far as the domino effect is concerned, there are positive effects as well. 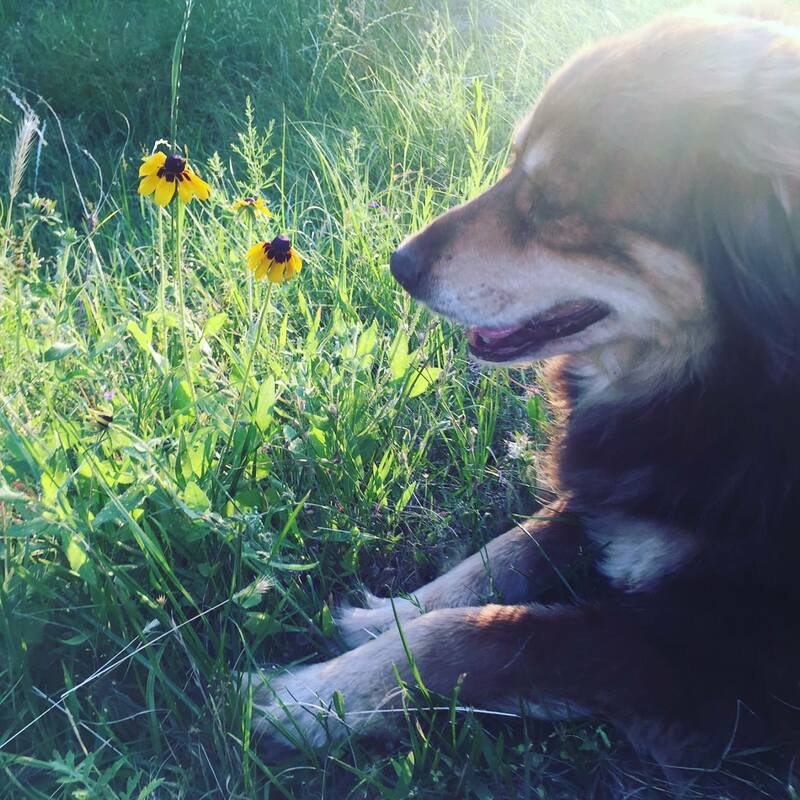 The feeling that ensues as you gaze upon the animals you have raised, the structures you have built, and the scenery God created is not to be equaled. The sense of satisfaction that we have experienced from our adventure on Green Acres is the best domino effect of them all. Another funny and informative blog from the animal farm. I can attest to the fact that it is a little disconcerting to turn and see a 1,000 pound cow running to join the other two who were standing behind me looking curiously as I unloaded luggage. Haha!! I’m sure it is a little surprising, to say the least!! Love you tons, Mom! !